Rising rate of incidence of cardiovascular diseases is a growing concern across the globe. Rise in health awareness leads to increasing interest in food, beverage and dietary supplement solutions that can be incorporated into a healthy lifestyle. Cardiovascular diseases (CVDs) is the top killer in Europe. Almost 50% of all deaths in Europe every year (i.e. four million deaths) are caused by cardiovascular diseases. According to the World Health Organization, cardiovascular diseases were responsible for 45% of deaths in China in 2012. Considering the country’s rapidly aging population, the percentage is expected to increase by 50% by 2030. Currently, approximately 100 million adults in the U.S., which is nearly 50% of the country’s adult population, have levels of cholesterol higher than the desirable. According to the World Health Organization (WHO), even a small reduction in the blood cholesterol level can make a great difference to the risk of developing heart diseases. Phytosterols are proved to lower the cholesterol level by 7%–10% in 2–3 weeks when used daily with meals. The U.S. FDA-approved health claim states that 1.3 grams of plant sterols per day as part of a diet that is low in saturated fat and cholesterol can reduce the risk of developing heart diseases. Thus, usage of phytosterols in the diet helps in reduction of the cholesterol level among patients with cardiovascular diseases (CVDs). Demand for a variety of foods is rising across the world. In addition, growing population, changing food preferences, and rising purchasing capacity are some of the important factors anticipated to drive the global food sector in the next few years. Easy availability of these products in convenience stores and supermarkets is another key factor driving the sector. Phytosterols are primarily used in dietary supplements and foods, such as liquid and oil-based supplements, as well as in shots and soft-gelatin capsules, instant powders, and chewable, swallow-able and effervescent supplements. Phytosterols are also used in milk, juices, desserts, yogurt, cake-filling creams, ice creams, and mousses. Phytosterols are also employed in baked goods, biscuits, cookies, cakes, and yeast-raised baked goods. Enrichment of foods such as margarine, cheese, butter, yogurt, condensed milk, and cream with phytosterol esters has been an important development in functional foods to enhance the cholesterol-lowering ability of traditional food products. Thus, rise in the demand for various types of foods such as bakery products, dairy products, supplements, and beverages is augmenting the demand for phytosterols. Production of phytosterols is solely dependent on supply of raw materials such as vegetable oils and tall oils. Vegetable oils include corn oil, soybean oil, sunflower oil, and rapeseed oil. Production of these oils is completely dependent on seasonal variations. Vegetable oil prices fluctuate due to poor climatic conditions in several parts of the world. Numerous countries across the world witness droughts, which affects the production of oilseeds. This, in turn, results in volatility in prices of vegetable oils. Seasonal variation affects output due to uneven and critical rainfall patterns in springs. Reduction in the rainfall over the last few years has resulted in significant uncertainty in agricultural yields in several countries, with variations in input as well as output prices. Also, increase in the cost of agricultural produce as well as storage and transport results in high prices of vegetable oils and tall oils. Thus, raw material prices fluctuate depending on the climate, which hampers the demand for phytosterols. In terms of demand, Europe is expected to hold a dominant share of the global sterols market during the forecast period. The sterols market in the region is anticipated to expand at a rapid pace than that in other regions during the forecast period, owing to rise in the consumption of sterols in food and nutraceuticals industries in the region. The market in Asia Pacific and North America is estimated to expand at a substantial pace during the forecast period, due to presence of well-established manufacturers of sterols in these regions. The sterols market in Middle East & Africa is anticipated to expand during the forecast period, due to rise in the demand for sterols in the food industry in the region. Latin America, especially Brazil, is projected to be an emerging region of the global sterols market during the forecast period. 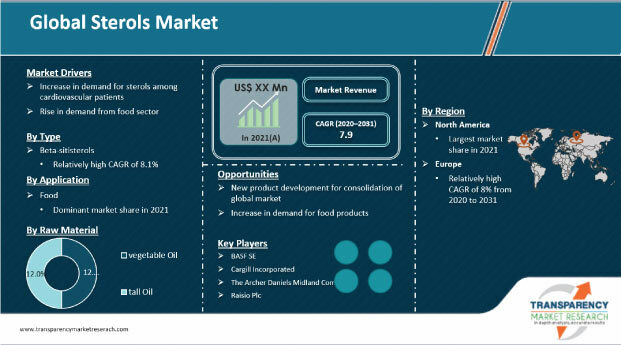 Key players profiled in the report on the global sterols market include BASF SE, Cargill Incorporated, The Archer Daniels Midland Company, Raisio Plc., Arboris LLC, ConnOils LLC, Vitae Caps S.A., Lipofoods SLU (Lubrizol Company), Xi'an Healthful Biotechnology Co., Ltd., Matrix Fine Sciences Pvt. Ltd., Fairchem Specialty Limited, and Advanced Organic Materials, S.A.